As a travel nurse, obtaining RN licenses in multiple states can open up new opportunities for fulfilling assignments and higher pay rates. Maintaining multiple state nursing licenses is an investment that will give you expansive choices when you are looking for your next travel nurse assignment. States with the highest-paying assignments, like California and New York, can take more than a month to process your application, so the sooner you start the process, the faster you can earn the pay you deserve. Fastaff is committed to fueling your ambition and we offer licensing programs to help nurses become licensed in states they are not currently licensed in. Our team is well-versed in the various nurse licensing systems and can help guide you through the process. If you’re interested in learning more, recruiters are standing by to answer your questions. Fastaff wants you to have the option of working in any state across the U.S. If you apply for a new or renewed state license, and accept and complete a Fastaff assignment in that same state, we will reimburse your fees*. To learn more about the qualifications, processing time and necessary information associated with specific state nurse licensing, click on the state below. 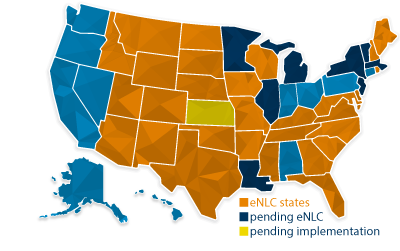 The Enhanced Nurse Licensure Compact allows any nurse who resides in one of the 27 participating compact states to practice nursing in any of the states forming the compact state alliance. In order to work in a compact state, a nurse must have proof of residence in a compact state as well as a current, active RN license in said state. The nurse does not need to obtain licensure in any of the other participating compact states. For detailed information about the eNLC, click here. In order to work in a compact state, a nurse must have proof of residence in a compact state as well as a current, active RN license in said state. The nurse does not need to obtain licensure in any of the other participating compact states. For detailed information about the NLC, click here. With all but one state joining the eNLC, the NLC will dissolve July 18, 2018. However, CO, NM, WI, and RI nurses with a multistate license can work in CO, NM, WI, and RI for six months after their state has joined the eNLC.